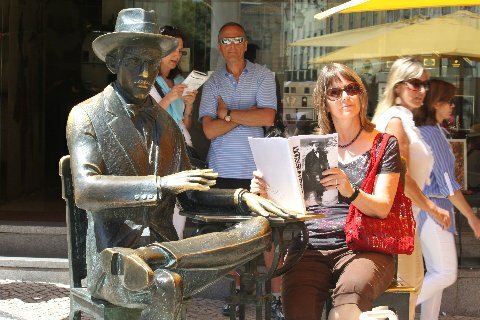 Here I am mixing it up in Lisbon with none other than Fernando Pessoa himself back in 2011 when I led a workshop there with Disquiet International Literary Program. Fernando and I were discussing the problem of heteronyms while awaiting our afternoon coffee. I’m happy to announce that I’ll be returning to Lisbon (and Fernando!) this summer to teach another workshop and am looking for writers who might be interested in an international literary experience, one you will never forget. That’s not because of the workshop I’m leading, but because of this fantastic program and group of writers. Disquiet offers a rich literary and cultural experience. You will fall in love with Lisbon. In the meantime I’m mulling over a heteronym. It feels about time for a new me.